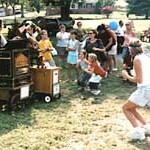 Our Organ Grinder is a popular entertainer at fairs and other outdoor community events in the Virginia and Maryland suburbs of Washington, DC and in the District of Columbia. 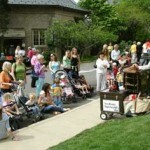 At events where families are expected, such as art and craft shows, seasonal fairs, and community events, the organ grinder is both festive and historical. 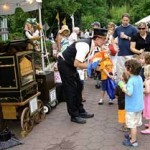 As an organ grinder, he is typically right on the street or pathway used by the attending crowd. 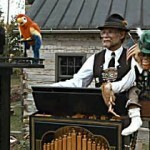 While playing upbeat tunes of many kinds on his Raffin Street Organ, he entertains with his handmade German mechanical monkey, Wastel, and his mechanical parrot and tucan. And there are usually a few fairgoers who are willing to dance the “chicken dance,” an Oktoberfest favorite. Parents with children, especially those with tots in strollers, like to gather in close to give the youngsters time to listen and watch. Adults are fascinated to discover an instrument and entertainment they assumed no longer existed. For some senior citizens, it brings back memories of the organ grinder they enjoyed in their childhood. Do you have a real monkey? Well, he is real, but he is not alive, if that is what you are wondering. Organ grinders a hundred years ago had live monkeys because they could hold cups to collect the money the men needed to support their families. But monkeys are wild animals. They are very dirty, can be mean, and can bite. Our organ grinder has special mechanical animals to continue the tradition without the risk and liability of a live monkey. 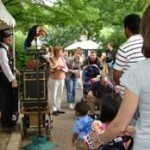 Does the organ grinder ever stroll? Yes, he has a smaller “busker” type organ that he can carry on a strap. It plays with punched paper rolls, like the larger street organ, but the sound is not as loud because it has fewer pipes. It can even be used for events indoors! His mechanical animals get the day off when he plays this organ.